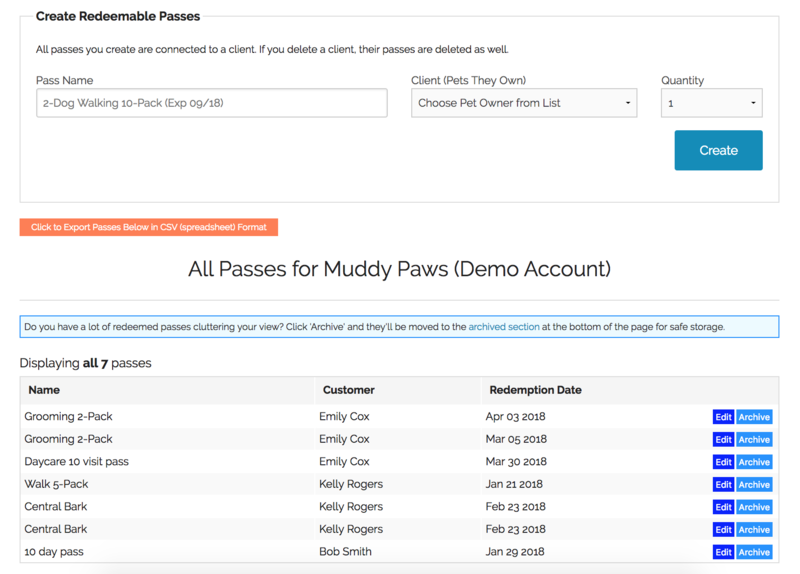 If your business sells "packs" of services, like Boarding 5-Packs and the such, DoggieDashboard's redeemable passes feature will help you keep track of how many of the services have been redeemed and how many remain. Pre-selling services in a great way to increase your revenue and redeemable passes makes it easy to keep track of how many each client has remaining. When a pet is checked in, you're prompted to select a redeemable pass to redeem. This makes it easy to sell 5-packs of boarding stays and redeem one pass every time the pet owner drops off their dog. Once a pass has been redeemed, you can "archive" it for your records. This will remove it from the main screen to help unclutter your view, but keep it visible in all reports.